First, I want to report on my Longview, Texas signing at the Books-A-Million there. It was another sell-out! Every book in the store signed and sold. I left Longview and went on to my parents’ house, to their Hendrix, Oklahoma Opry, and then helped them with their 60th Anniversary Celebration today. A great number of friends and neighbors came to wish them well and give congratulations. I just returned home a few minutes ago. My mother so needed this day to be great. I’m so glad it turned out well for her. “Chappo was Geronimo’s only son at the time, and a proven warrior. When the Chiricahua prisoners arrived in Florida in late 1886, he was immediately sent to the Carylse School in Pennsylvania with other young men and boys. About a year later, gravely sick with TB, he was sent back to his family, now at Mt. Vernon, Alabama, where he died three days later. Chappo is buried near Mobile, Alabama.” Below, I’ve posted a photo of Chappo taken from the same Website. He is the one on the left, and his father Geronimo, the one on the far right with the Springfield rifle and ramrod. 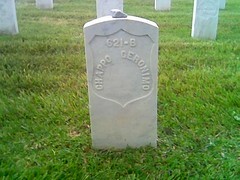 Below that photo is the photo I took of Chappo’s grave in Mobile. In 1960, my late husband and son drove to Apache Summit, in Mescalero, New Mexico, and stopped at Apache Summit to dine. As we approached the site, we met an American Indian of about age 50 who told us that he was Geronimo’s son. 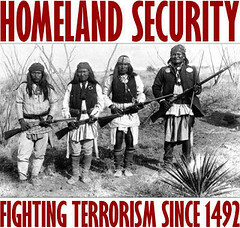 We spoke with him and he referred to the time when the Apaches were invaded by the white men. We asked if we could take his photo and offered to pay a fee, and he agreed. I am wondering if your research has led you to discover a son of the great warrior, Geronimo, and whether we learned the truth from the man with whom we spoke. I have a photograph of him which I could provide should you request it. Many thanks for any information you may provide. Best wishes, Rosalie Thompson, 48 Villa Christina, La Luz, New Mexico 88337.